Mix together the flour, sugar, baking powder, black pepper and salt. Place the cherries on the bottom of the pans. 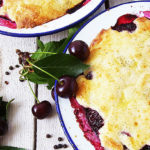 Using a tablespoon, divide the batter into both pans to cover the sour cherries. Sprinkle with ground black pepper (optional). Bake for 28 minutes or until golden on top. Serve with whipped cream and mint leaves to taste.